The Dayak are the indigenous tribes of Borneo who live in groups living in rural, mountain, and so on. Dayak word itself is actually given by the Malay people who come to Borneo. Dayak people actually using the name of Dayak objection, for it is interpreted rather negative. In fact, the Dayaks motto is "Menteng Ueh mammoth", which means someone who has the power of courage, and know not to give up or persist.Dayak origin of the word itself until now people still disagree. Some call comes from the word 'power', which in Kenyah language means river or inland. But there are also outside the Dayak people, especially in the last century who interpret it as head-hunters or hunters. This is possibly due to their past tradition of warlike tribal, by beheading their enemies as a symbol of conquest as well as 'friends' (for those, who already decapitated head of an enemy it could also be interpreted as a friend, because in addition to protecting them from the spirits evil, can also bring a blessing or fortune). In one study, mentioned, at first Dayak tribes from Yunnan Province, a region in southern China (Mainland). They later settled in the Apo Kayan, the Long gorgeous now, near the border with Malaysia. When it comes from, no one knows-because the Dayak culture left no written records-cataan. After that they spread to all corners of Borneo, especially along the river flow. Meanwhile, according to Dayak beliefs, especially the interior of Kalimantan, which passed from mouth to mouth, from grandmother to father, from father to son, until recently the unwritten lead to more or less than the truth, that the origin of the ancestors of the tribe Dayak is derived from the seventh heaven to this world with "Palangka boelau" (Palangka means holy, clean, a shelf, as the stretcher is sacred, holy axle of gold derived from the sky, often also referred to "rack or Kalangkang"). According to the historian, formerly the Asian continent and the island of Borneo, which is part of the country that are still fused, allowing the Mongoloid race of wandering through the Asian mainland and arrived in Borneo to cross the mountains now called the mountains "Muller-Schwaner '. Dayak tribe of Borneo is the true population. But after the Malays of Sumatra and the Malay Peninsula came, they increasingly retreat into. Not to mention the arrival of the Bugis, Makasar, and Java at the height of the Majapahit Kingdom. Dayak tribes living scattered across the Kalimantan region in the long span of time, they have spread down the river-the river to the downstream and then inhabit the coast of the island of Borneo. This tribe is composed of several tribes, each of which has different properties and behavior. Dayak tribes had built an empire. In the Dayak oral tradition, often called "Nansarunai Usak Java", ie, a kingdom that was destroyed by the Dayak Nansarunai Majapahit, which is estimated to occur between the years 1309-1389 (Fridolin Measure, 1971). The incident resulted in the Dayak tribe driven and scattered, partly into the hinterland. The next major currents occur when the influence of Islamic kingdom of Demak berasala with the entry of Malay traders (circa 1608). Most of the Dayak tribe embraced Islam and no longer recognizes him as the Dayaks, but calls himself a Malay or Banjar. While the Dayak people who reject the religion of Islam back down the river, into the interior of Central Kalimantan, have settled in areas of Tangi Wood, Amuntai, Margasari, Watang Amandit, Lawas and Labuan Watang Balangan. Sebagain longer continue to push into the jungle. The Dayak adherents of Islam are mostly located in South Kalimantan and some Kotawaringin, one of the famous Sultan of the Sultanate of Banjar is Gastric Mangkurat is actually a Dayak (Ma'anyan or Ot Danum). Not only from the archipelago, other nations also came to Borneo. Chinese nation is expected to start coming to Borneo during the Ming Dynasty in 1368-1643. 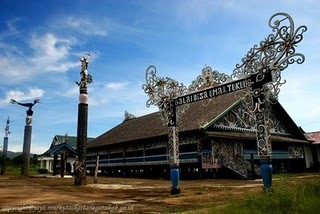 Of starch lettered manuscripts mentioned that the city's first visit is Banjarmasin. But it remains unclear whether the Chinese came in the era Bajarmasin (under the Majapahit hegemony) or in the Islamic era. The arrival of the Chinese nation does not result in displacement Dayak population and has no direct effect because it directly because they only trade, especially with the kingdom of Banjar Banjarmasin. They do not directly trade with the Dayaks. The legacy of the Chinese nation was saved by some Dayak tribes like malawen dishes, pots (jars) and ceramic equipment.